Villa Cap au Vent is a four bedroom villa with four en-suite bathrooms. All bedrooms are air-conditioned. The villa also has a separate living room with home threat system, an undercover outdoor dining room and a gourmet kitchen. The villa has an occupancy that is limited to six people. For more information on the room types please see above link. Villa au Vent is located on the Island of St Bart’s. The Villa is situated approximately 14 minutes from the airport, 5 minutes from the beach, 15 minutes from town and 10 minutes from shops and restaurants. St Bart’s is serviced by commercial aircraft directly from some US cities. 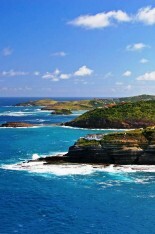 There are also commercial flights available from St Maartin and Guadeloupe for those coming directly from Europe. Private Jets can also land at St Bart’s on application. Villa Cap au Vent is a luxury private villa located on the exotic island of St Bart’s in the Caribbean. Perched on a cliff at the tip of Pointe Milou, the villa is situated in St Bart’s chicest neighborhood. Its secluded and totally private location has spectacular views of the surrounding ocean. As well as having four bedrooms, each with their own en-suite bathroom, the luxury villa also features a spacious living room, outdoor covered dining room and a gourmet kitchen. This five star residence also has a pool that overhangs the cliff and ocean below as well as an expansive terrace for soaking up the West Indies sunshine. The Villa has the best of everything from Italian cookware and French glassware, to a top of the line media system. All appliances and furnishings in the house are of the very best quality. European touches accent the sparkling bathrooms and the finest linens and towels make guests feel totally pampered. St Bart’s is famous for its wonderful choice of restaurants and the villa is situated just fifteen minutes from town, ten minutes from local shops and just five minutes from the nearest beach. 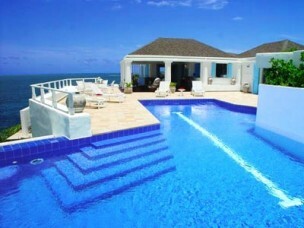 Villa Cap au Vent has a spectacular pool that over hangs the cliff face and takes in the magnificent ocean views. The villa comes with a stainless steel charcoal grill, fitness equipment, Radio and CD player with Bose speakers. IPod docking stations are in all bedrooms. The home theatre system includes Satellite Dish Network, flat screen with Bose surround sound, and DVD player. Communication equipment includes a telephone and fax machine with free calls to the US and high speed internet connection/WIFI. A housekeeper lives on the grounds but is housed a separate residence. She serves complimentary breakfast with fresh croissants and baguette and provides daily maid service and nightly turndown. Laundry service is also provided.